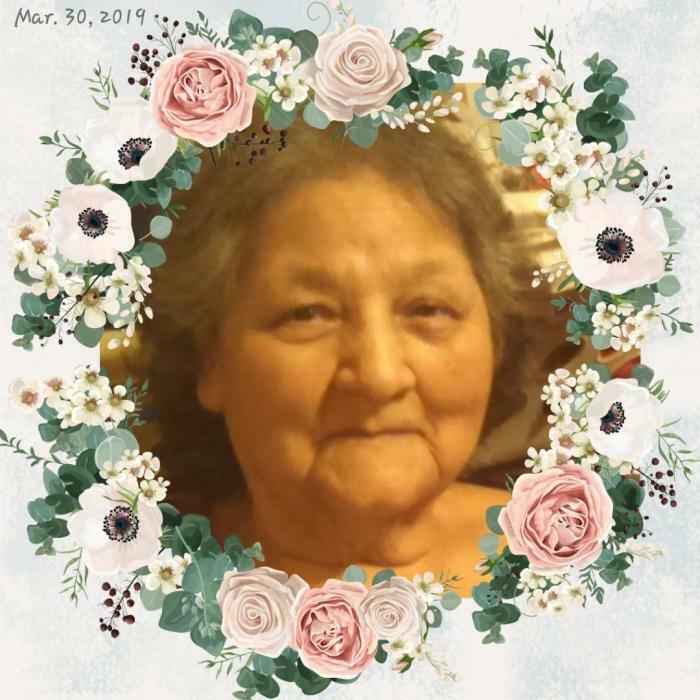 Emilia Montes Delgado, 81, of Silver City went into the arms of the Lord on Saturday, March 30, 2019 at her residence surrounded by her family. Visitation will take place on Wednesday, April 3, 2019 from five to seven in the evening at Baca’s Funeral Chapels followed by the Prayer Vigil at seven o’clock in the evening. The Funeral Mass will be on Thursday, April 4, 2019 at nine o’clock in the morning at St. Francis Newman Center. Immediately following will be concluding services and burial at St. Vincent de Paul Catholic Cemetery. Officiating will be Father Bartholomew Ezenwelem. Serving as pallbearers will be James Delgado, Hondo Jaurequi, Antonio Delgado, Lawrence Turrieta Jr., Isaac Delgado and Joshua Turrieta. Honorary pallbearers will be Tony Delgado, Mark Delgado, Jeremy Delgado, Faibyan Carrillo, Edward Vasquez, Alex Jaurequi, Robert Velasquez and her numerous nieces and nephews. Emilia was born in Silver City on September 11, 1937 to Louis B. Montes and Dionicia S. Montes. She was a very loving wife, mother, grandmother and sister to all her family. Emilia enjoyed cooking, camping, watching her novelas, listening to music and spending time with her family. She will be missed dearly. Emilia is survived by her loving husband of 57 years, Antonio F. Delgado; two daughters, Patty Jaurequi (Alex), Judy Vasquez (Edward); two sons, Tony Delgado and James Delgado (Yolanda) all of Silver City. She also leaves behind 21 grandchildren, 28 great-grandchildren; a special grandson, Isaac Delgado and a special granddaughter, Melissa Velasquez; her special dog, Butterscotch; ten brothers and sisters, Josie Ponce (Cruz) of Silver City, Antonia Castrillo of Tucson, AZ., Ramona Pena (Manuel) of Hurley, Henry Montes (Ruth) of Mesa, AZ., Jimmy Montes (Gloria) of California, Elsie Pacheco (Larry) of Chamita, NM., Margie Esqueda (Johnny) of Bayard, Virginia Gonzales (Willie) of Bayard, Mary Dorcheus of Silver City and Willie Montes (Mary) of Tennessee; numerous nieces and nephews. She was preceded in death by her parents, Louis and Dionicia Montes; daughter, Yvonne Delgado; grandson, Isaiah Madrid; great-granddaughter, Ilyana Rose Lopez; sister, Teresa Lucero and brother Ignacio Montes.